Many officers are unclear as to how they are expected to operate in these incidents. GARDAI HAVE SAID that there needs to be clear guidelines in place regarding how they are expected to police evictions, especially when they happen in rural areas where officers and the person being evicted are likely to know each other. Sergeant Paul McDermott, Roscommon/Longford Division, described how many officers are unclear as to how they are expected to operate in these incidents. He said: “There should be a set of standard operating procedures put in place for clarity for our members on their duties at these events. “Not referring to particular incidents, incidents are arising around the country, we have seen them in Dublin, seen them around the country in rural areas. Particularly in rural areas, members who are embedded in their community and asked to go to these, issues about notice about these, planning and resourcing, health and safety, members need clarity when they are going out. In many cases, gardai have received serious threats from people. McDermott said that gardai should be given adequate notice so they can prepare for any situation like this. He added that the health and safety of everybody involved is a priority. McDermott said: “Adequate notice when these things are happening to allow us plan for them. Sheriff provides us with order, you have to have plan, an operational plan, health and safety of everybody involved. Email “'There have been threats against us': Gardai call for clear guidelines around how they police evictions”. 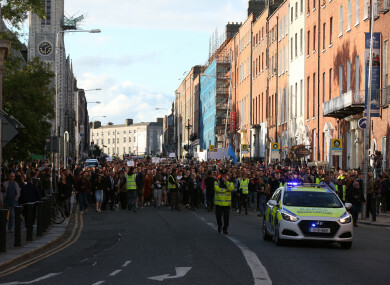 Feedback on “'There have been threats against us': Gardai call for clear guidelines around how they police evictions”.